Yahoo changed the game of email storage by fixing unlimited to 1 Terabytes of capacity for storing the emails for free accounts. You have plenty of space available now to keep all your emails at one place, and even to backup your data. In the first quarter of 2013 Yahoo had upgraded the free storage available for flickr.com to 1TB. We think Yahoo must planning to provide a Yahoo Cloud Storage solution, mostly unified with its flickr and mail accounts! 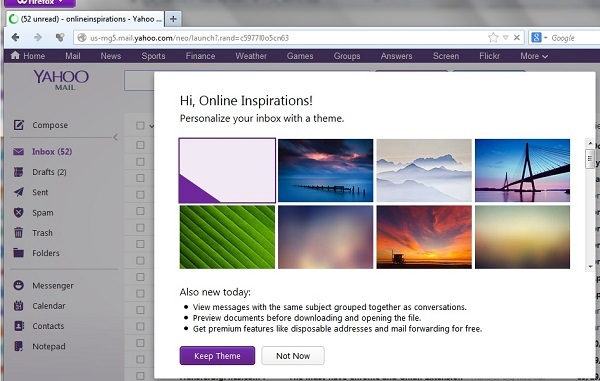 Also, the new Yahoo mail comes with a more beautiful and aesthetic themes! If you like to change your theme, then go to left bottom, and click on the image icon or press ‘Esc’ key twice. Let us wait for other email service providers to surprise us!